Atlanta, GA: The India American Cultural Association was formed by a handful of Indian Americans in 1971 inAtlanta. As the community grew steadily a need was felt for a home for IACA. The existing building, named India Cultural andReligiousCenter, on 1281 Cooper Lake Rd.SE,Smyrna,GA30082, was bought in March 1984. The Center was renovated and the inauguration ofICRCTemple, one of the oldestTemplesinAtlanta, took place in July 1986, and deities were ceremoniously installed. Since then the currentTemplehas truly lived up to its name and been attracting worshippers who come to offer their prayers and also to celebrate major Indian holy days and festivals. In addition theTemplehas played a sterling role in promoting education and rich Indian culture and heritage through language classes, Indian Classical Dances and yoga classes, etc. fostering harmony and unity in the family and the community. To meet the rising need of a growing Indian community, a more spacious community center and bigger and vibrant temple was necessary. To meet those needs IACA acquired adjoining homes and land during 1998 thru 2001. The size of the IACA campus increased from previous 3.5 acres to 10.4 acres. On December 4, 2005, a resolution for developing anIndiaCenterand a new Sanatan Mandir was passed by the General Body of IACA. The resolution also stipulated separate buildings for both projects. The concept of developing Sanatan Mandir took shape first. In 2009, Phase 1 of the development began. This included completion of the parking lot. On June 11, 2014, the board of governors, the executive committee of the new Sanatan Mandir unanimously approved the Shilanyas Mahotsav-the foundation stone laying ceremony, to be held on the auspicious Ganesh Chaturthi Day on Friday/Saturday, August 29 and 30, 2014. Here, it may be pertinent to cite some statistics to help the reader get an idea of the new Sanatan Mandir. *Building A: 6985 Sq. Ft.
*Building B: 6440 Sq. Ft. 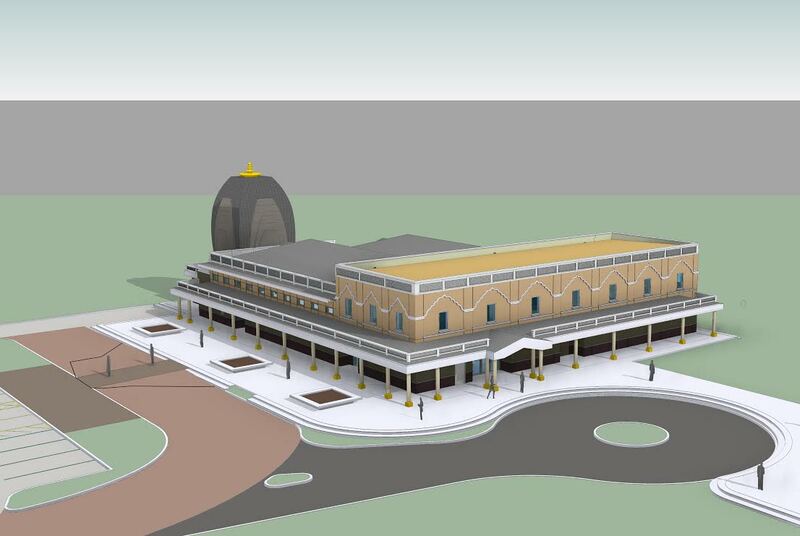 It will have the authentic Bhartiya Mandir appearance and appeal. In addition to more spacious facilities for prayers and celebration of major Indian festivals and holy days, the temple will also provide facilities for the educational and cultural activities for everyone, including the young generation as well as for the seniors. On August 29 and 30, Sanatan Mandir organized a spectacular, joyous, spiritually suffused, ritually studded and reverential Shilanyas Mahotsav, the second stage in the construction of a temple. Shilanyas literally means laying the foundation stone. 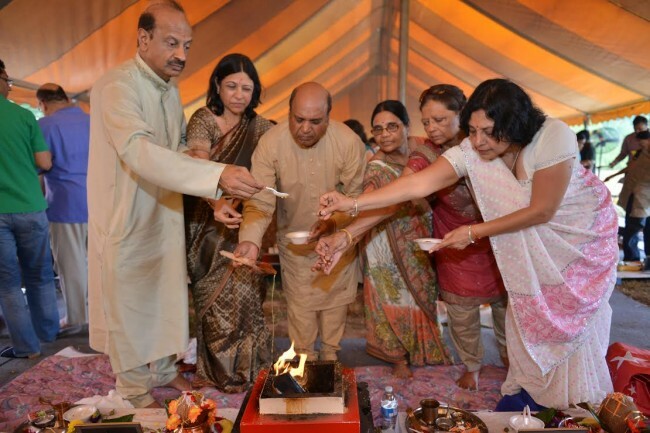 The ceremony was attended by over 500 worshippers including many leading members of the community and also dedicated, committed and focused members of both IACA and Sanatan Mandir Board and Executive members. The Sanatan Mandir priest Acharya Pramod Padhiji, Shilanyas event coordinator Prafulbhai Desai, and Priests from Shakti Mandir, Shiv Mandir, and even the Nepali community, conducted the ceremony under a huge canopy. The Mahotsav began on Friday with Ganapati Pooja, Panchdevata Shobha-yatra (ceremonial procession of the worshippers carrying Shila to be consecrated for Shilanyas Pooja). This ritual brings the community around the holy event and the construction that will follow. The cheerful and enthusiastic devotees took part in an hour long Shobha-yatra from old site to the hallowed site of the new Mandir, to the accompaniment of dhol nagara, Chanting of Vedic Mantras and Pushpa Vrishti. Then the priests installed Ganapati Murti in the present Mandir. Ganeshji loves ladoos. So 1008 ladoos (Modak) archana was made. This was followed with aarti and delicious Mahaprasad. The Mahotsava continued on Saturday, August 30, with Ganapati Pooja; Kalash and Matrika Pujan; Panchaayatan Devata Pujan; Vishwa Karma Pujan; Rajgir Pujan; Shila Pujan and Sthapan to name a few rituals. The priests chanted various Vedic Mantras to invoke blessings of all the Gods. A Foundation pit was dug and a small vessel containing sacraments and a Foundation-Stone ceremoniously placed right below the Garbhagriha (the innermost sanctum of the temple where the presiding deity resides).Various holy objects were also placed in the pit with the spontaneous outpouring of gifts and donations from the devotees. Jay Patel, architect, and Tushar Sanghvi, general contractor, were recognized. Tushar Sanghvi who is a long time supporter of IACA, is going to perform his services pro-bono. Sanatan Mandir really appreciates his generous offer and his dedication to theTemple, said board members. Later many devotees participated in a spiritually elevating havan. This was followed with aarti and delectable mahaprasad. Shilanyas Mahotsav helped raise $175,000. In addition there were new pledges of about $85,000. 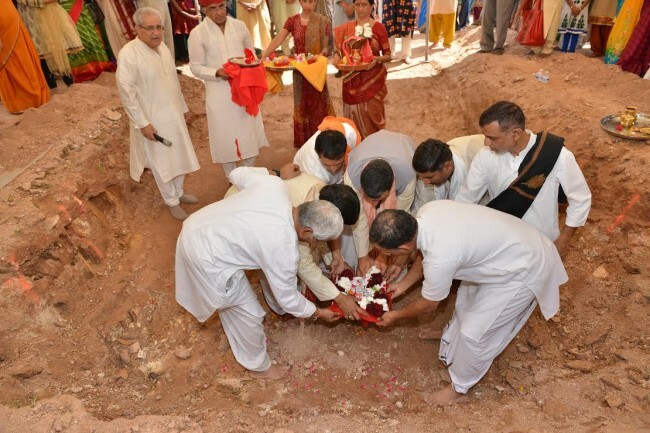 Now that Shilanyas Mahotsav has been successfully completed, temple construction will begin soon and the new Sanatan Mandir is expected to be inaugurated in approximately 40 weeks after the construction begins. The Sanatan Mandir president, Bhupen Bivek and officers have strongly exhorted the community to support the mandir through donations in cash or kind; or by volunteering.